Someone once said: "Live your best life, now". These words indeed summarises the whole essence of life. Life can be a game. Life sometimes is not fair. Daily Business doesn’t usually work out the way we plan. Marriages are failing. The economy is contracting. Losses can happen when we least expect it. Sometimes we can control these event and most times it is very obvious that we may not be in full control of events and circumstances. How then do we handle the shock of these sudden changes? How should we react to ugly circumstances when they show up? What's this buzz about living on purpose? How do we keep our sanity as women in the midst of all these chaos? The interesting part of all these is: We all have been given a destiny to fulfill but when life happens, as it always will and then we get buried in our pain, sorrow and guilt. We become less focused, more distracted, too tired to keep pushing, extremely pained to move on, slowly we let our purpose slip through our fingers and what we have left is only a tip of who we are meant to be. 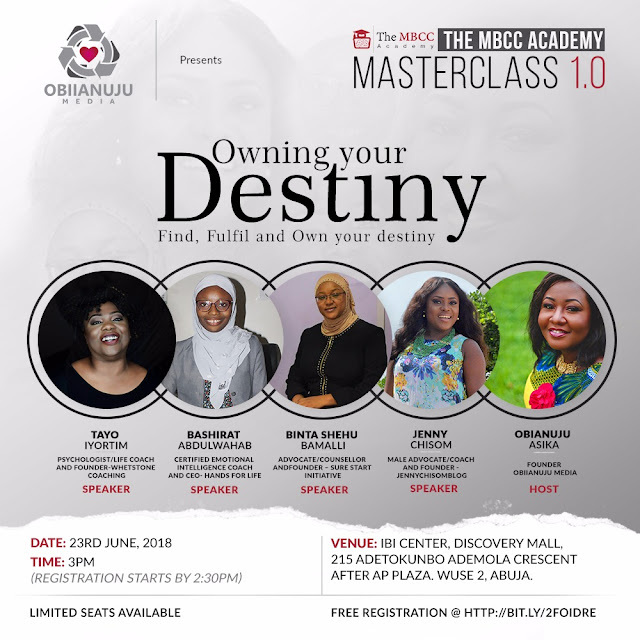 BUT there is another beautiful side to life that only YOU can activate and we would love to coach you as we learn to find, fulfill and own our destinies through Kind mindfulness. Be a part of *The MBCC Academy MasterClass1.0* on Saturday June 23rd. Registration and photo moments Starts at 2:30pm. Venue: The IBI center, discovery mall, opposite AP plaza, wuse 2. Sponsorships and Supports are welcomed. Supported by: HP, Happy Devas, 1705 media, BodyCreed fitness center, Hands for life, Jenny Chisom Blog, Diary of an Abuja Mom, Abuja events and places.